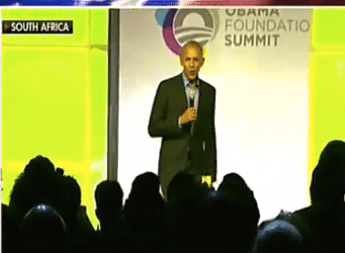 Tucker Carlson reveals that Obama gave a speech in South Africa last month and thanked SA President Cyril Ramaphosa for “inspiring new hope in this great country!” Ramaphosa announced he will change his country’s constitution to seize land from white farmers, without compensation, which is purely based on racial grounds. Many white farmers have been brutally killed and many more are fleeing the country for their lives, and Tucker says that Obama must know this. The land grab is an emotional reaction to populist rhetoric, without any thought of the adverse consequences that includes loss of foreign investment. In addition, about 70% of the eight million hectares of the land that was previously seized and redistributed in 1994 is now fallow. The proposed amendment to the South African constitution that will see farmers’ land seized without compensation will scare away foreign investors and imperil food security, the head of Transvaal Agricultural Union told RT. South African President Cyril Ramaphosa announced on Tuesday that the ruling African National Congress (ANC) would formally introduce an amendment into the parliament that would legalize the redistribution of land, most of which has been owned by the country’s white minority since the 1600s. Bennie Van Zyl, the general manager of the Agricultural Union of South Africa (TAU SA), believes the result would be the exact opposite. “For us, this is a pity that they’ve made their choice, because no one will invest in this economy and we actually need growth to address the realities of South Africa. So we have great concern for this approach,” Van Zyl said. He said that some foreign countries have already reached out to the union and warned they would have to pull the plug on investing in South Africa’s agriculture if the expropriation law is enacted. “A lot of foreign countries that have already contacted us as an organization say if that is the case, we are not willing to invest in your country anymore,” he said, adding that the law is going to “kill” investment. “And if the ANC goes through with this, it will be devastating for this country,” he said. Past experience of expropriation isn’t reassuring, either, as many of the farms that have been handed over under the ANC have gone out of production. It is estimated that the major share of the land transferred since the apartheid system’s collapse in 1994 suffered a drop in production or is no longer cultivated. The Economist reported that about 70 percent of the eight million hectares of the redistributed land is now fallow.